We're getting back into our routines and we're busier than we've been since May when the last school year ended. This feels right to me. I have often wished I could be more at ease with a slower pace. Even in college, I woke up early and got to work. I don't like to be run ragged, of course, but I like to have things going on. I think all of us in the Thistlebear home are that way. None of us really knows how to laze, we just can't figure out how to do it. Being back in the school routine helps us feel like ourselves again. We're happiest when our home is a busy, buzzing hive. I'm driving back and forth to the small Bears' schools in the first half of the day, doing errands in between trips, and spending the afternoons at home with them, working on homeschool and school-driven homework assignments. We continued our audiobooks all summer and I love that this is a habit in our lives. I work on crafting projects while we listen and I need this hour in my day: a built-in hour for quiet sewing or crocheting. I'm still working on the baby ripple I started in July. It's almost done now, I just need to do another six or seven inches of ripply stripes. The recipient is expected to arrive at the end of September. I'm using Stylecraft Special DK. I've been looking through my crochet books and others from the library to decide how I want to edge the blanket and I think I'm going to keep it simple, just a few rounds to give it a nice finish. I'm very happy with the colors; I think it has a vintage feel and I've enjoyed working with gray shades, which is new for me. I've done some more appliqueing. I'm really enjoying it a lot. This is a child-size apron for a little friend who is turning five soon. She's having a birthday party this weekend. I've had this fabric for a long time and it's one of my favorites; I used it in the LB's baby quilt. I did the same simple stitching that I've done on other aprons and bags for my kids and their friends, but I've been experimenting with other stitches elsewhere; I have something to share soon. I received a Deramore's shipment last week. I did some shopping during their big clearance sale a few weeks ago. I've enjoyed working with the grays so much that I decided to add some other neutrals and mid-tones to my Stylecraft stash. 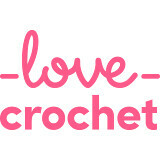 When I started crocheting in earnest last year, I was very drawn to the bright colors used by a few bloggers. For my first few projects I really tried to imitate that style but I've been discovering more of my own tastes lately; I like the brights but I like to mix them with softer colors too. This order included Gray and a few browns (Mocha, Brown and Camel), as well as a pale yellow (Sunshine), Parchment (grayish-tan) and White, in addition to Grape and Claret. 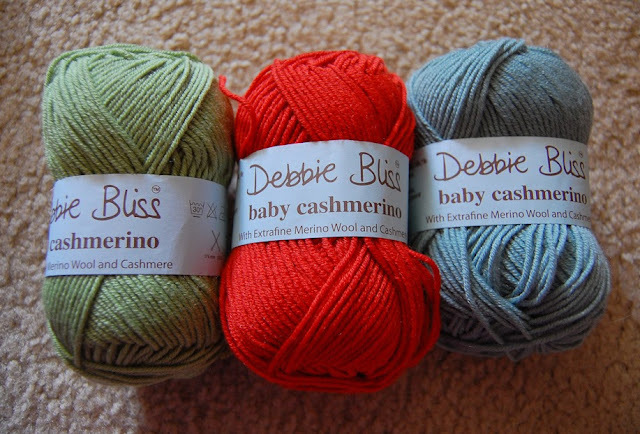 I also ordered three balls of Debbie Bliss Baby Cashmerino, to add to my stash. This is my current Baby Cashmerino stash. I'm collecting brighter colors right now, just a few balls at a time. I still want to acquire darks and neutrals, but this yarn is expensive so I'm collecting them slowly. I have a couple of smaller projects in mind for this yarn - wearable things for myself - which I plan to start working on soon. A closer look at my new Baby Cashmerino. The sale made them much less expensive, about $6.70 per ball, as opposed to $10-11 that I've paid in the local yarn shop. I do think it's important to support small, local business, of course and I have bought about ten balls there, but I couldn't resist such a good discount for a few more balls. 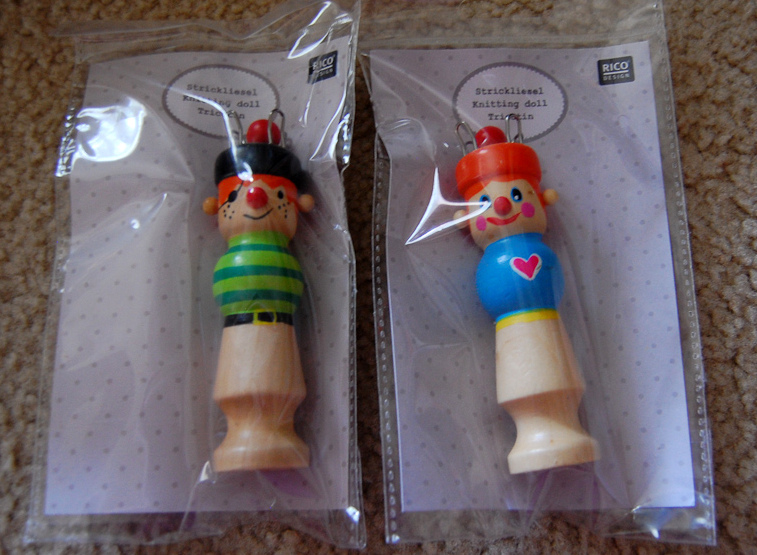 I also ordered these Rico knitting dolls, which were very inexpensive in the sale. They're for the small Bears; Santa Claus will be leaving the dolls in their Christmas stockings this year. The LB has a knitting doll at my in-laws' house and he enjoys working on it when he's there. He makes long "snakes" that he gives away to people. I think he'll like having his own knitting doll at home and the GB will have one to learn with too. We were surprised on the LB's first day back at school when we checked out the fish pond in the courtyard. The school's caretaker had placed waterlily plants in the pond back in the spring. They weren't flowering yet and some of us were a bit skeptical that they would make it through the summer, but they did! And now they're flowering beautifully. The fish are thriving too. What a nice feature to have in a school. Meanwhile at home, there are early signs of autumn. Our pyracantha hedge, which runs along the back garden wall, develops green berries all summer after the spring blooms fade. As usual, the green berries are turning orange in late summer. By October, they will be a deep rust color. Each of the bushes seems to do this at a slightly different pace but it's definitely underway. When I look out toward the backyard now, the orange berries are first to catch my eye. I'm still bringing cut flowers into the house and will be able to do so for another month, maybe more. Here, I have red roses and Russian sage with a few pink Roses of Sharon, displayed in a Mason jar with a crocheted cover. I love the brightness of this bouquet on the kitchen table. It's a cozy, rosy posy. In the afternoons, I make time for a cup of tea. I might drink it while helping a small Bear with his or her learning tasks, but it's an important part of my day. Sometimes I have the chance to drink it while reading blogs, which is one of the best ways to enjoy a cup of tea. I take mine milky, with two sugars. And sometimes a few cookies (right now I'm loving Lattemiele Italian-style milk-and-honey biscuits from Trader Joe's). It's not all academic. We play lots and do artwork too. Here, small Bears and a big one spent some time painting with watercolors. That's the LB's tea mug, he likes a cuppa (herbal) too. I feel more motivated about cooking now that's it not quite so hot most days. When I'm hot, I barely care to eat, let alone put great effort into cooking. But I feel better about it when it's cooler. These vegetables were roasted with pork chops and we all enjoyed a fall-ish dinner. I'm still trying to eat breakfast every day. I started this campaign last winter and I've mostly been successful. I wasn't making the effort for a long time and that isn't a healthy choice, I know. It isn't hard, though. This is just Rice Krispies, milk and sliced strawberries but I'm glad I'm building the habit; I feel better with breakfast inside. This guy is having a birthday today! 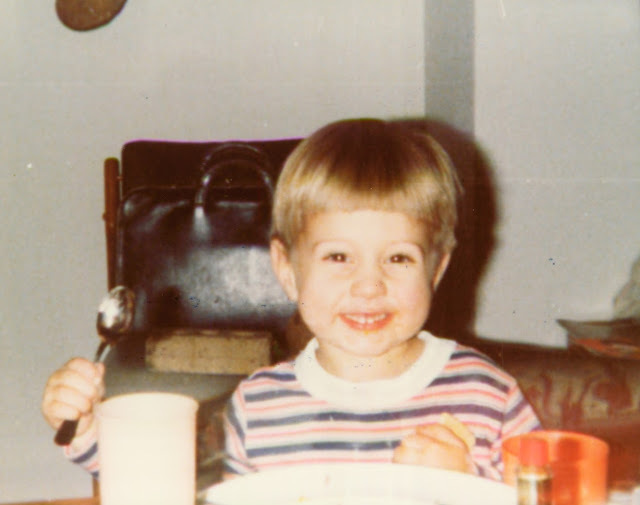 That's the Bear when he was a little boy. He's a lot bigger now, but I really love this picture of him. He was born the same day Elvis Presley died. He jokes about being the reincarnation (I don't believe it). This year marks the fifteenth birthday I have spent with him. Life with him gets better every year. I'm making tiramisu today, to eat tomorrow when we celebrate with his parents. He has chosen a restaurant dinner, not the Tram ride I was encouraging, but a dinner out is always okay with me. He chose tiramisu as his birthday cake, as he has chosen most years we've been together. A notable exception was during the Great Blackout of 2003, when close to 50 million people in the northeastern US and the Canadian province of Ontario lost electricity (this included us, as we lived in New York at the time). I believe the power grid failed when a tree fell on a cable. I had just put his requested cheesecake in the oven about twenty minutes before the electricity went out (and stayed out for many hours). I had to throw away the cheesecake. I think we bought a cake at the grocery store the next day when the power came back. Since then, he's had no-bake tiramisu. Happy Birthday to Bear! I enjoyed all the pictures you shared today! Happy Birthday to the Big Bear! Lovely colours of wool for you to work with, and loving the nearly done blanket. Hope that the tiramisu and birthday party are wonderful! Jennifer first I have to say I love your crochet cozy for your mason jar... Id like to try that, did you use a pattern or just go for it? Also how do your children do school for half a day and home school for the other half? That is very interesting! I can't wait to see what you make for yourself with that beautiful yarn. I have to say that I actually miss the feeling of being in school. High school that is. I've been thinking about that alot. I used to love walking out of school on a beautiful day and knowing I was free the rest of the day to do things that I needed to do. There's a different vibe when the school years starts. I love the apron!!! We used to have our names on ours. It made us feel important :) That fruit and veggies look so good! While I could eat them all day, I found this summer that when it was hot out I tended not to eat them. It's weird. I love the colours in your ripple blanket. They look well thought out and very cosy. Hope your hubby had a great birthday Jennifer. 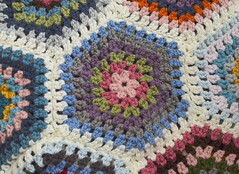 I love your ripple blanket and also the colours too, its beautiful. I havent done any ripple work yet, it looks complicated to me! 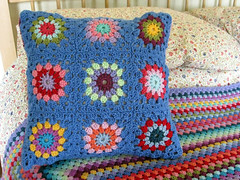 What a great post, I love the colours in your Ripple Blanket, I love Deramores so much, they are quite local to me. I am drinking some tea right now reading your blog, feels like old friends catching up. Love your ripple, and I have to say I am a bit jealous about your beautiful yarn delivery, nothing like beautiful yarn coming to you in the mail. 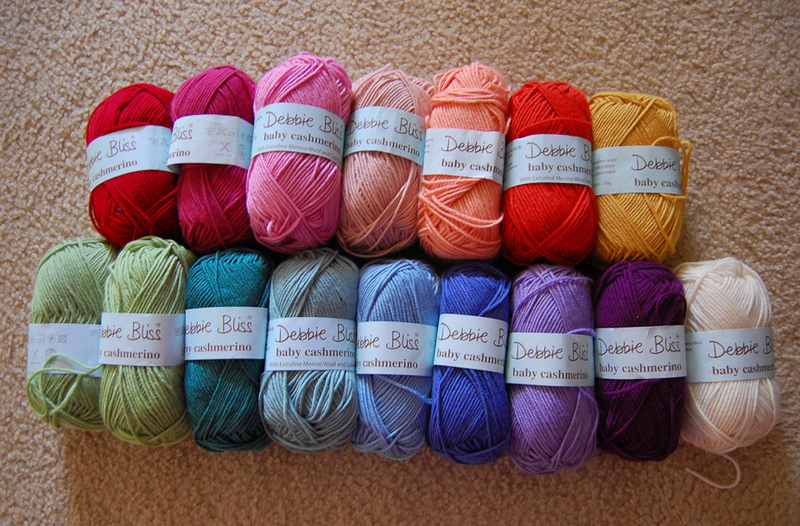 I love Debbie Bliss, those colors are gorgeous. Happy birthday to your little Bear! I really enjoyed this post of yours; such a lovely potpourri of your routine, which sure sounds and looks great from where I'm sitting! From your kitting and sewing crafts to your cooking and flower arrangements, the colours and patterns, there's nothing 'routine' about all the beauty! Beautiful post of bits and bobs and of course, a very happy birthday to your husband. Have a wonderful celebration and a great weekend. Ooh I feel a bit old! I left school the year Elvis died ... Happy Birthday, Bear! School hasn't gone back here yet, not until September, and I think I do like the routine too ... I still get up early like you, but the teenagers certainly know how to laze! Big changes this year, Millie has left school so is starting college and Harry is leaving home to go to University. I love your pictures, of busyness, and home, and food ... and I really really love the crochet jar cover! I love, and can completely relate to, your sentiment regarding want to accomplish things, but no feel like you've been worn ragged. That's a balancing act I'm forever trying get even slightly close to being even. Much easier said than done, it is truly so important to at least try. Happiest birthday wishes to Bear! Hi Jennifer, What a lovely parcel!! !Love ALL the colors!!! I also mix brights and darker shades together!! !Personally,I like to tone the brights down just a little!! !Happy B/Day to your man!! !Hope you have a fab day!!! Oh my goodness I could hardly keep with all the goings on in your home, soon like it just the wy ou like it. Happy belated birthday to your hubby, I hope he had a lovely day, and another lovely day today when he celebrated with his parents. I loved reading about all the crafty elements of this post. 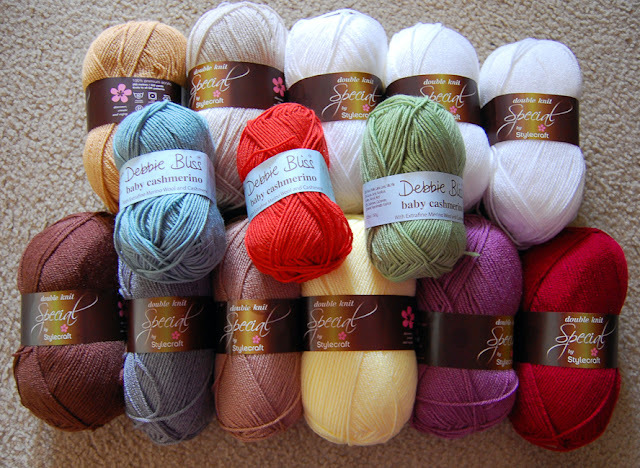 I love your Debbie Bliss stash. I've wondered about doing the same thing myself, buying a couple of balls at a time and putting it away until I have a worthwhile amount, it's just so expensive to buy a whole load in one go. The colours of your ripple blanket go so well together, I'm looking forward to seeing it finished, and especially seeing what you do with the border as that's something I'm wondering about for the ripple blanket I'm making myself at the moment. I just loved all those photos that illustrate what's going on for you guys right now. There seems to be lots of wool on the blogosphere lately!! Wow, that's a lot of yarn! Happy Birthday to your husband! I hope you all are enjoying a wonderful celebration today with family. Your flowers are so gorgeous on your dining table, and I love your placemats! Your afternoon tea look delicious! I need to pick-up a box of the milk and honey biscuits the next time I am at Trader Joe's. A Beary Happy Birthday to Big Bear - and that is a gorgeous pic! Loving your ripple and your new yarn Jennifer, as well as the latest apron with the very interesting stitchwork - and all your lovely news. The waterlilies are so beautiful and so nice for the children at school. Thank you for sharing your lovely life with us! Such a lovely homely post. Your baby ripple blanket is looking so lovely, and all that new yarn is just gorgeous! Have you ever tried porridge for breakfast ... it makes a great start to my day. The baby blanket that you're working on is so beautiful. I'm sure whomever is the lucky recipient will love it! Nothing like a handmade gift from the heart. You mentioned your kids going to school in the mornings, then home-schooling in the afternoons...so are they in some kind of school for home-schooled kids half days? They do have programs like that here in my area (IL). Have a wonderful week! Just had to say what a beautiful blog that you have.And that little/grown boy very well could have Elvis in his soul.I remember that day well,I was in Germany waiting to babysit up early that morning.I was 17 and it tore me up.I can feel your woman soul flowing out to others and your crafts are so beautiful from one woman to another.I also raised a naturals daughter and grand girls too who all touch this world each and everyday.Honor to meet you while I was searching for a friend,s site on facebook,whom I still can not find yet.Oh well I met a kindred soul,you.Thanks.